It feels official after that beautiful Easter weather – spring is on its way! I've spotted a few buds popping up in my garden, but am all too anxious to start seeing green. Luckily, I've teamed up with the lovely Bronwen from Twig Florals to show you some creative and accessible ways to bring greenery into your home this spring (or year-round)! We had a fun day shooting with Lauren Gabrielle Photography, and I was thrilled to collaborate with Bronwen again, who was the talent behind our wedding florals. Many of the greens featured here can be found at a garden center or grocery store (think Trader Joe's, Whole Foods, or Heinen's). We'd also recommend calling your local florist – they are usually willing to order anything specific you might need. Just be sure to ask about minimum order quantities, since they are likely working with a wholesale supplier. Continue reading below to learn about the varieties we used, and see how to spruce up your home for spring! Blue eucalyptus can be so impactful – it smells amazing, and its silvery blue leaves add a striking focal point to any color palette. I usually place a sprig or two in bud vases, but loved Bronwen's suggestion to fill a large vessel with a bunch of stems. Here, we used a terra cotta crock and an oversized blue bottle, but you could also recreate the look in a galvanized metal vase or bucket. The look is very easy to accomplish – fill your vessel with water, and place your stems in, a few at a time. Arrange the taller stems toward the middle, with shorter stems along the sides. For the freshest greens, look no further than your own backyard! Bronwen suggests exploring your yard or neighborhood for vines, fresh-cut sprigs from bushes, or even herbs from your garden to add to small bud vases or bottles. Rosemary, mint, thyme, or lavender make beautiful and aromatic additions to small spaces or shelves. These would look charming in a kitchen, on a bar cart, or on a side table in a guest room. Don't have an herb garden? Hit up your grocery store for pre-packaged stems in the produce section. This wall arrangement would make a beautiful statement for a party, a shower, or seasonal brunch. Here, we used a "K" as a monogram design, which would be super cute to represent a bride's new last name, or a baby's initial for a baby shower. You could also arrange the greens in a shape instead of a letter – a heart or circular wreath would work nicely. This makes a statement no matter where you hang it – we chose to place it over a mantle, but you could also arrange this over a bar cart or table setup for a party. Completing this arrangement takes a bit of time and finesse, but it's not overly advanced. We recommend starting with a sketch, then translating that to the wall. Cut the vine into sections to make up the limbs of the letter (the sizes will depend on how large you're making it). Attach each vine to the wall using masking tape, securing where needed. Try to hide the tape if you can, or choose a tape that matches your wall color. Once your vines are in place, you can add bits of florals to enhance the monogram. Here, we used small snips of green hydrangea and white aster (which look like mini daisies) to complete the spring look. Attach them to the vines using tiny bits of tape. If you can't get your hands on ruscus vine, you could likely forage some English ivy from your neighborhood (you know, the vines that grow like crazy over fences, walls, basically anywhere you don't want it)! Green hydrangeas always seem to be available at Heinen's (for the local readers) and you could probably find the white aster there as well. For a more everyday look, use a collection of mini bottles to create a statement in numbers. These are easy to find at craft stores or thrift shops, and look great when arranged with a variety of other colors, shapes, and sizes. Here, we filled them with a mix of sword fern and tree ivy – the contrast of the whispy tree ivy and the strong, straight nature of the sword fern makes for an interesting pairing. Sticking with only 2-3 types of greenery will also keep the look from getting too busy. Arrange them on a console table as shown, or line them up on a dining table for an interesting centerpiece. This is another super simple (yet super beautiful) way to spruce up your dining table for a spring brunch or a romantic dinner at home. To create this look, you'll want to start with approximately 10-12 stems of seeded eucalyptus. You can usually find seeded eucalyptus at a premium grocery store, but I've also been able to get it through a local florist. Using scissors or pruning shears, trim off the thick portion of each stem, leaving only the more delicate main stem that the leaves and seeds are attached to. Starting from one end of the table, place one stem after another, overlapping them to create fullness. Fluff and arrange the leaves as needed to fill in any gaps or to hide the stems of the other pieces. And that's it! You can enhance the look by introducing some greenery in your place setting – here, we simply tucked a sprig of fresh rosemary into the napkin ring. Bronwen and I were excited to share this little dose of DIY, just in time for spring. I love to bring the outdoors in, and until my garden starts blooming, these are five easy ways to do it (which don't involve the constant care of a houseplant, either)! If you have questions about any of the looks you've seen here, feel free to leave a comment and either Bronwen or I will happily answer them. Huge thank you again to Bronwen, Lauren, and Salt + Honey for making this little collaboration happen. Happy spring to you all! There are few things that feel worse than shopping regret – running out of beer is a close second – but I experienced this on a facepalm-worthy level last week. I'd had my eye on these cute little Kate Spade glitter earrings but was resisting the urge to buy, since it's Christmastime and I guess I should shop for other people? Is that how it works? Until one day when I was shopping for other people, and saw them again, during a 20% off sale. I added them to my cart, deciding they would stalk me forever if I didn't. I stepped away for a few minutes, came back to click "submit" and I get the dreaded error message: "THIS ITEM IS UNAVAILABLE." I'm sorry...WHAT. I refreshed, I tried re-adding, searching every other site that carried them...Sold. Out. Everywhere. If I had any idea that these were possibly the LAST ONES OUT THERE I wouldn't have thought twice. Ugh. So mad. But why get mad, when you can get even...I set out to try to replicate them myself. The results were great and the best part is, you can really make them look however you want them to. Although if you're feeling lazy, you can find the original earrings on ebay, selling for upwards of $114 (no joke). 1) Start by removing the stones from the earring setting – use the needlenose pliers to gently bend the prongs back to loosen the stone. I only bent two prongs instead of all four, and it was enough to get the stone out. I had these earrings already, but you can find similar ones at Target, or even use a pair of Kate Spade ones to get the most accurate look. 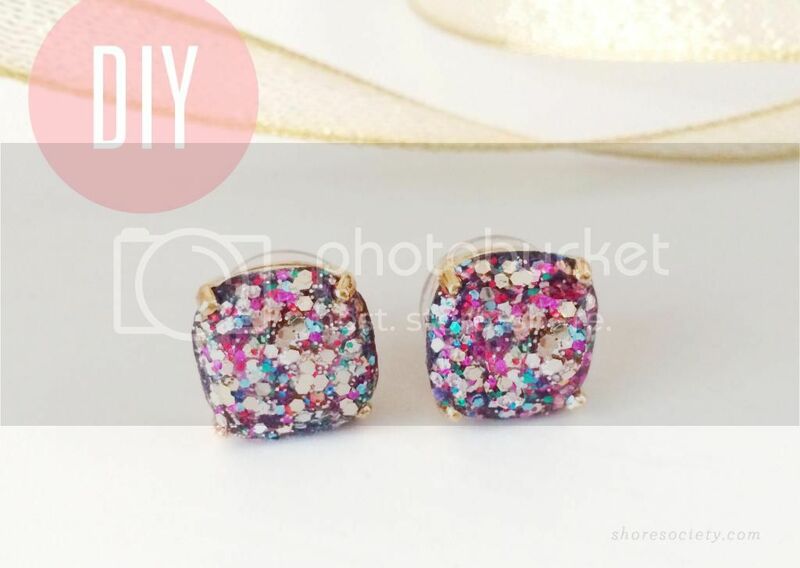 2) Holding one stone with your pliers, apply a thin layer of glitter topcoat to the earrings. Try to cover the edges as well – that's one advantage of removing the stone from the setting. Let each layer dry before adding another one (this is where the hairdryer comes in handy). 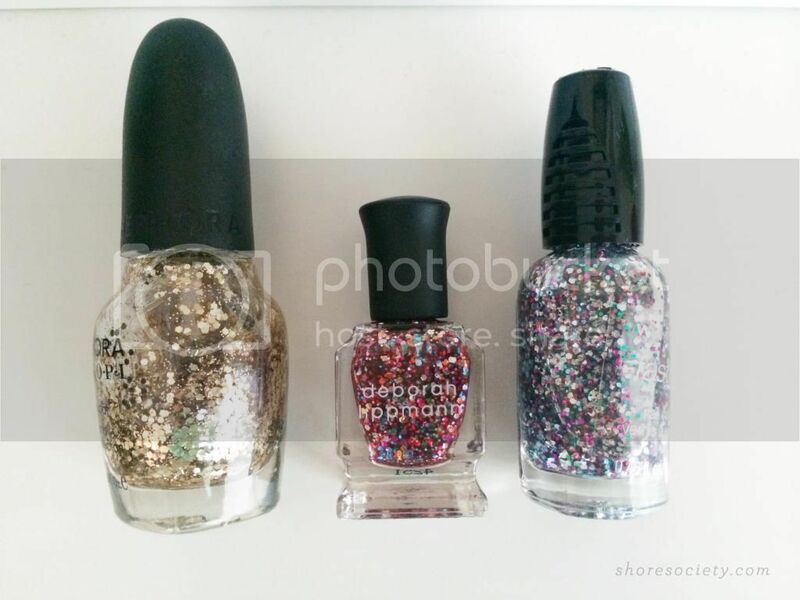 Layer the polish on however you like – I used three types of glitter to get the multi-colored look I wanted. 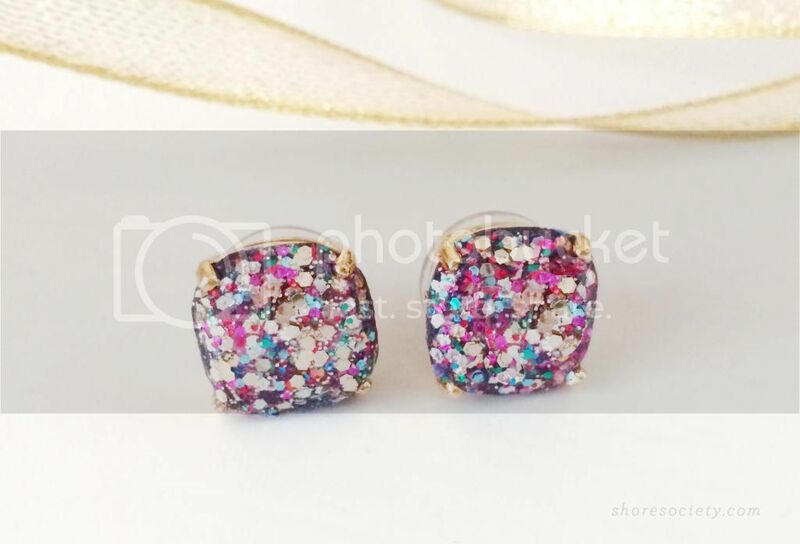 The original earrings had a lot of gold, pink, blue, and red-orange. 3) Let the polish dry thoroughly before replacing them into the setting – I let mine dry overnight just to be safe. Snap the stones into place and bend the prongs back over them. Using nail polish instead of loose glitter keeps the glitter from flaking and shedding all over the place, but that's another option to try if you want a different look. Now I don't feel so bummed, and have some fun studs to wear for the holiday season. Crisis averted! When it comes to antiques, I'm usually cautious about altering their appearance in fear of destroying their value (file this under: everything I know I learned from Pawn Stars). We were faced with a lot of these decisions when we moved into our house – we had to decide what needed to be kept and what was okay to touch. For example, our living room is full of original cherry wood trim...and even though it wasn't my thing at first, it's an element that adds real value to our home, and we'd be crazy to paint it. Now I'm happy it's there – the wood is beautiful, and makes our living room feel like a modern cabin. On the flip side, just because something is an antique doesn't make it valuable (though it could be emotionally valuable) and a little coat of paint isn't going to hurt anyone, if it makes you happy. Jim and I decided to check out the Lakewood city-wide garage sale a few weekends ago and after heading down a ton of driveways, we found this antique mirror with a $5 sticker on it. I'm sorry – what? $5. This is why I love garage sales. The bones of it were there, but we knew the paint job and the metal stars wouldn't really fit our decor. Thankfully the mirror was made of wood and not metal, so we knew we could give it a quick makeover and find a great home for it on our walls. I actually can't take any credit for this makeover, because Jim did it all himself, but hey...I art directed? He removed the metal stars, which were just pinned into the frame with small nails, and then stripped off the paint with Strypeeze. This causes the paint to bubble and peel like tar, so be sure to wear gloves when trying this at home. He used a shim to scrape the paint off once it became loose. Once the paint was removed, he used wood filler to fill the cracks where some of the pieces were separating, and gave the piece a final sanding. We actually liked the distressed look that the stripping/sanding process gave, so we left the mirror as is. I debated about white-washing it, or putting the stars back on, but decided against it. You can always add, but you can't always take away. It turned out to be the perfect piece we were missing in our second floor stairway. I love it more than I expected – for $5 I figured it was a risk-free project, so it was great that it came out so nicely. I can't really say no to something nautical for a few bucks, anyway. Do you shop garage sales? Are they worth it for you, or too hit-or-miss? When it comes to Gossip Girl, I am not embarrassed to admit that I know a bit too much about the show, and anyone who's a fan knows about the top-notch art collection shown in GG's various Upper East-side apartments. One of the set's most recognizable pieces is an illuminated sign by Elmgreen and Dragset, meant to serve as a road sign for the pair's famous art installation – a non-functioning faux Prada store about 60km outside of Marfa, Texas. It serves as a perfectly chic backdrop to the stylish characters and money-drenched drama—it's always somewhere in the scene. It's black+white and gorgeous, so clearly, I wanted it in our peachy-glam guest room. As an art enthusiast lacking an art collector's budget, my only options to own this iconic piece were to either purchase a canvas version here, or make my own. You all know I like a challenge, so off to the drawing board I went. This looks a lot harder than it was (although it takes a steady hand) so here's a step-by-step plan if you're interested in making your own. Pre-stretched art canvas - I went with 30x40" for the full large-scale effect, like the original. 1. Start by creating the template for the design. To do this, I used an image of the artwork online, and imported it into Photoshop. I created a new Photoshop file in the size of the canvas (30x40") and imported the image as a layer in that file. I played with the scale of the art until the size looked correct, and printed the giant image out by tiling it onto regular letter-sized sheets of paper. Each printer is different, so I can't exactly walk you through how to do this, but Google can be helpful if you're not sure. Since you'll be scaling up a low-res web image, the letters will be pixellated, but you can cut away that fuzzy pixel halo when you trim the letters out. 2. To make the stencils, you'll carefully cut out each number and letter. I found that it made the most sense to cut the larger characters out ("Prada" and the arrow) and the smaller characters away from the sheet of paper, keeping them together like a stencil. This way, they're easier to trace and you won't have to worry about aligning each letter on the baseline, as they're already aligned for you. 3. Use a ruler to figure out the placement of the stencils on the canvas. I recommend having an image of the actual art pulled up on your computer, or printed out, so you can reference the linespacing. It won't necessarily be mathematically even, you just want it to look right. Double-check all of your measurements to be sure nothing is slanting up or down—the type is the hero here, and anything "off" will become pretty obvious once you paint. When you're sure, carefully tape everything down. 4. Now, trace everything. Use a pencil and be very, very gentle. It's difficult to erase pencil off of canvas, and you'll only need a ghost of a line to guide you during the painting process. 5. Once you've outlined everything, remove the stencils and tape and double check that everything looks correct before you begin to paint. I suggest taking a look from a distance – prop the canvas up against a wall and see how it looks from there. 6. Finally, you'll paint in the letters. You can make it easier on yourself by outlining the letters with a marker first, to get crisper edges. You'll probably need a few coats of paint to get everything looking solid. It's actually better to have your paint thinned down a bit with water or acrylic medium, because it will make the paint glide more smoothly across those detailed curves. Just keep layering the paint on, allowing it to dry between coats. Acrylic dries very quickly—by the time I finished one application, the first letter I did was ready for a recoat. Easy as that! I feel like Lily Van Der Woodsen already. We're still working on finishing up the guest room, but this is starting to pull it all together. Let me know if you decide to give it a try! This little project is probably topping my list of easiest DIY ever. I've seen a lot of cute distressed wood cut-outs in decor shops and online sales like One Kings Lane, but knew it would be just as easy to make my own and have it exactly how I wanted it. We had a bit of a dead space in out bathroom above the towel bar, and since we already have art and floating shelves on the other wall, I needed something different. With our bathroom decor feeling like a cloudy day at the beach (the only way I can describe it), I knew a little wood whale would be perfect. I purchased the cut-out whale from Nana's Little Nest on Etsy – it was a pre-cut item but Cindy also does custom work, so you can get exactly what you're looking for. The rest of the DIY is almost too easy. Once you have your cut-out, you'll paint it whichever color you want (I used acrylic paint). Since we wanted ours to be white with the natural wood showing through in the distressing, we just painted it white, but if you want to do a two-color look, you'll paint the first layer one color, and the second layer your most dominant color. You'll basically just be lightly sanding away the top coat to reveal what's underneath. Your paint doesn't need to be perfect – as you can see in the photo, I didn't even paint it solid white – but you do want to follow the grain of the wood. Let it dry overnight before sanding it. After it's finished, you can mount it to the wall using double-sided mounting tape. We had some cork furniture pads laying around, so we used those to give a little more dimension, and keep it from looking flat on the wall. The entire project cost about $5, no joke. Now I'm debating another one...just have to figure out where to put it! It perfectly solves for the awkward space on the wall, when you don't want to just throw up more pictures in frames. How do you typically solve wall decor challenges? This week's DIY is up there as a favorite of mine — I've never attempted gold leafing before, but it was incredibly easy and only took an hour or so! I've had my eye on the Nate Berkus for Target tortoise shell sculpture ever since it came out, but I hesitated to buy it. The colors weren't quite what I wanted, and the $40 price point seemed a bit steep for the quality. I kept my eye on it, and when it was still in stock months later, and on sale for $25, I bought this ochre colored one and knew I'd find a way to make it work. Initially I thought about spray painting it, but happened to find instructions on how to use gold leaf, and knew it would give a more dimensional look and make the shell pop against our navy bedroom walls. Metal leaf is available in many different types and colors, and you can find it sold in kits at any local art/craft store, like Michael's or Pat Catan's. It works on most porous or non-porous surfaces, so you can apply it to almost anything, and really bling-out your house! 1) Before shot - not bad, but not great either. 2) Using your paintbrush, spread the adhesive evenly over the surface. According to the package instructions, the adhesive needed to air dry for 30-40 minutes to become tacky enough for the leaf to stick. 3) Begin applying the gold leaf, one sheet at a time. The sheets come in small squares, and are very delicate. They might even break apart a bit before you place them on the shell — it's okay, keep the little pieces nearby for when you need to fill in small gaps. Press the leaf gently onto the surface with your fingers, then smooth the leaf out carefully with a soft cloth. Work in sections, filling in the gaps with your scrap pieces as you go. The tricky part about the surface of the shell are all of the grooved lines — the full sheets won't reach down into the cracks, so you can fill those areas with leftover pieces after you finish the main body. 4) Using the cloth, smooth out the leaf, pressing carefully and moving in circles. The leaf won't look totally seamless, which is okay, it's what gives the finish more dimension! Once you've inspected the shell to make sure the gaps and sides are covered, you'll spread the sealer over the entire thing. The sealant keeps the gold leaf from coming into contact with the air, which prevents the gold from tarnishing. Let the shell dry overnight before hanging or placing back among your decor. And that's it! The whole project cost only about $35, and easily looks twice the price. I haven't been able to find anything with this impact anywhere else, and in such an accessible price range. Well worth the effort! Would you guys ever try gold leafing? I was this close to buying a set of hair elastics from Anthropologie a while back, but stopped short after I saw the price tag. $12 for only FIVE? Yikes! I put them back, thinking I could find them cheaper elsewhere, until I found a couple of tutorials online and decided to make them myself. This was ridiculously easy, and I was able to make about 45 hair ties for only $11 (take that, Anthropologie). Foldover elastic in 5/8" size - as many yards and whatever colors you'd like. Each yard makes about 4 hair ties. I purchased my elastic here. Measure and cut a piece of elastic (flat) to 8.25". If you have thicker hair, add another quarter or half inch. Also something to note: the glitter elastics seem to be less stretchy than the solids, so I added a half inch to those. Otherwise, they wouldn't fit on my wrist! Tie ends in a knot, leaving about half-inch sized tails, and trim ends together at an angle. Using a lighter, you'll seal the ends to keep them from fraying. Hold the flame close to the ends, without touching them. You'll see the fibers melt a little, creating a finished edge. And you're done! This is an easy, mindless thing to do while crushing through episodes of Homeland (obsessed with that show) or whatever you please :) I love these ties because they don't leave a big crease in your hair, and they look cuter on your wrist for those emergency ponytails. Hopefully this saves you a couple bucks, too, because I know I won't ever be buying these! Start by cutting your strips of black fabric. Depending on the size of your drapes, you'll want to do some math to figure out how long the stripes need to be. Mine were 84" long, and I wanted 4 black stripes, so I subtracted the grommet tab from the total length, then divided that by 7 (total stripes). Phew - this is boggling my math-inept brain. Each stripe ended up being 11". The length will be the same for all of the stripes except for the bottom one — it will have to be a couple inches longer, so it can be folded under for a finished look. For the rest, you will just leave the edges raw.